Earlier this week I updated the flowers in the two pots that flank my front door. With Valentine’s Day swiftly approaching I selected pink ranunculus and white candytuft. This led me to think about the different types of bouquets that Royal brides choose. So today’s post is Royal Wedding Wednesdays Bouquet Toss. There are two traditions associated with Royal brides. The first is that a sprig of Royal Myrtle (‘Myrtus communis’) is gathered from a bush at Osborne House. This was Queen Victoria’s main residence on the Isle of Wight. The royal myrtle plant was given to Queen Victoria in a posie by Albert’s grandmother in Gotha, Germany. The couple brought back the plant from Germany to the Isle of Wight, where it has thrived ever since. In ancient Greece, the myrtle plant was a symbol of love. It was sacred to Demeter, the goddess of fertility as well as to Aphrodite, the goddess of love. The ancient Romans inherited that tradition. With it being sacred to Venus, the goddess of love. Later myrtle became a Hebrew symbol for marriage. The symbolism remains to this day. Here is Queen Victoria, with her family, shown taking tea amongst her beloved myrtle. Queen Victoria’s bridal bouquet contained a single flower, snowdrops. It was Prince Albert’s favorite flower. She also wore orange blossoms in her hair and pinned to her gown. This caused other brides to follow suit. When the blossom began to be in short supply wax replicas were used. Queen Victoria’s daughter Victoria, the Princess Royal, married Prince Friedrich Wilhelm of Prussia (who later became the future Kaiser, German Emporer Frederick III) in 1858. A sprig of myrtle was cut from the plant for her wedding bouquet. She was the first Royal bride to include myrtle in her bouquet. 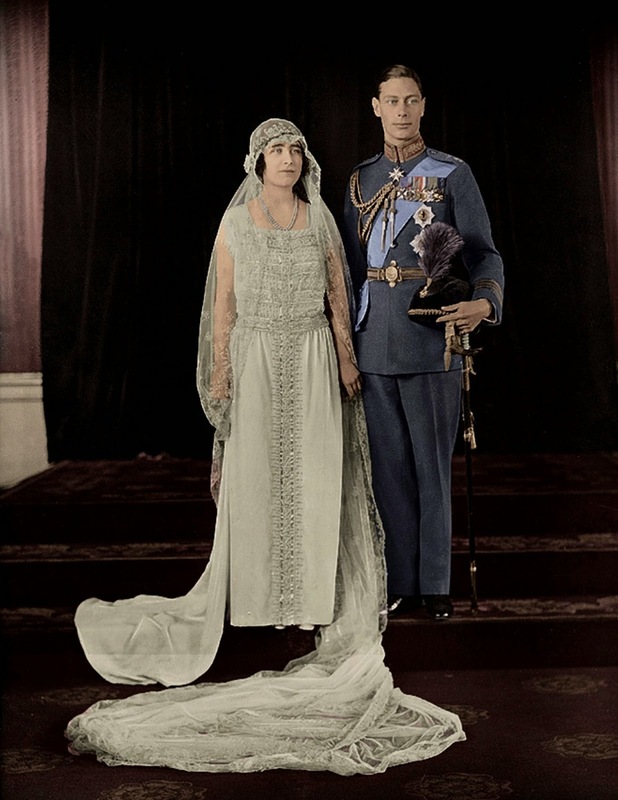 The second tradition was begun in 1923 by the Queen Mother (Lady Elizabeth Bowes-Lyon). 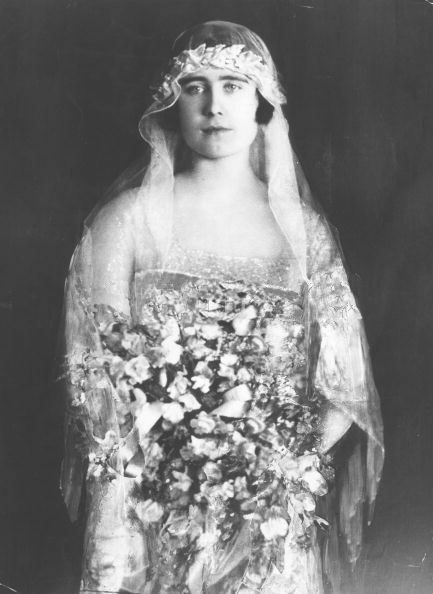 She laid her bridal bouquet at the grave of the Unknown Warrior in Westminster Abbey on her wedding day to Prince Albert “Bertie”, the Duke of York (later King George VI) in 1923. She did so in honor of her brother, Fergus, who died during the First World War. This is the reason you do not see her bouquet in official wedding photos. This tribute has continued. Royal brides now have the bouquet delivered to Westminster Abbey the day after the ceremony. Lady Elizabeth Bowes-Lyon carried a bouquet of white heather and white roses. The white heather symbolizes protection and wishes will come true, while the white rose represents innocence and purity as well as honor and reverence. Queen Elizabeth’s bouquet carries with it a mystery. Martin Longman, a florist with Worshipful Company of Gardeners made the bouquet overnight in his shop in Ludgate Hill and delivered it personally to Princess Elizabeth’s apartment at Buckingham Palace on the morning of November 20, 1947. The all-white bouquet featured three types of white British-grown orchids: Cattleya, Odontoglossum, and cypripedium as well as a sprig of myrtle. That sprig was then also planted to start a second special myrtle source. The orchid’s meaning is love, beauty, refinement and is also a Chinese symbol for many children. Misfortune seemed to follow Princess Elizabeth on her wedding day. Her wedding tiara snapped in two, her pearls were left at the wrong palace and later, sometime during the newlywed’s return to the Palace or during the wedding breakfast, the wedding bouquet was mislaid and could not be found in time for the group picture. Lady Diana avoided the same fate as her mother in law by having two identical bouquets made. I cannot even begin to think about how her arms must have ached from carrying this bouquet around on her wedding day in 1981. It measured 42″ long and 15″ wide and was said to weigh between 4 to 6 pounds. It was a gift from the Worshipful Company of Gardeners and was created by florist David Longman, whose father had created Queen Elizabeth’s wedding bouquet. Lady Diana Spencer’s waterfall bouquet had the Osborne House myrtle and another sentimental flower, yellow ‘Mountbatten’ roses, in honor of the recently deceased Lord Louis Mountbatten. He was Prince Charles’ great-uncle and “honorary grandfather”. The fragrant cascade echoed Queen Elizabeth’s with Odontoglossum orchids. It also contained lily of the valley, Hedera ivy, gardenias, freesias, Veronica, stephanotis and Tradescantia leaves. Princess Margaret, the Queen’s sister, carried a stunning bouquet of white orchids and stephanotis. 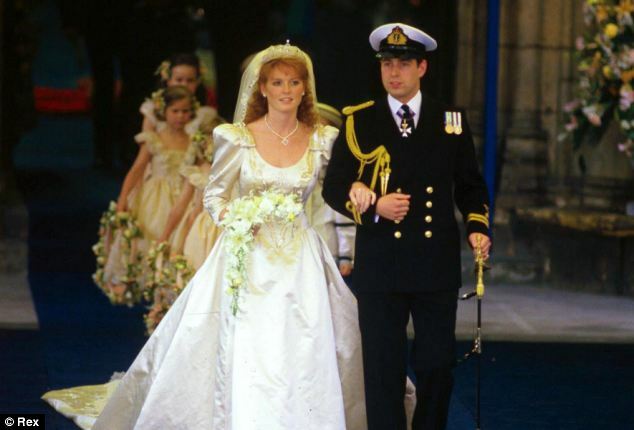 Sarah Ferguson, who became the Duchess of York when she married Prince Andrew, carried a crescent-shaped bouquet of cream lilies ~Majesty, palest yellow roses ~ Joy, Friendship, gardenias ~ Secret Love, lilies-of-the-valley ~ Sweetness and the traditional sprig of myrtle. Sophie Rhys ~ Jones carried a bouquet of ivory roses, calla lilies ~Beauty ~, stephanotis, clustered lily of the valley and ivory freesia when she married Prince Edward on June 19, 1999. 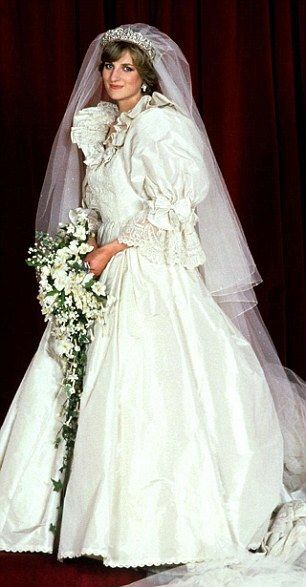 Camilla, Duchess of Cornwall, carried a small bouquet of lilies of the valley and primroses ~ I Can’t Live Without You ~ when she wed Prince Charles in 2005. 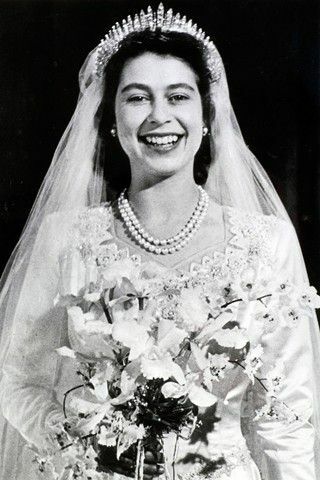 Queen Mary carried orange blossoms, “House of York” roses, white orchids, lilies of the valley and white “The Bride” carnations when she wed King George V.
Yet where was her daughter, Princess Mary’s, bouquet? 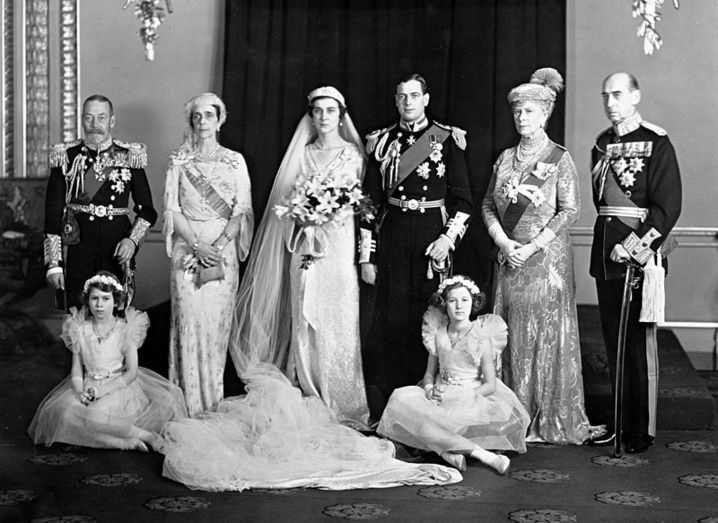 Princess Marina, Duchess of Kent, had a lovely bouquet of lilies and the future Queen (lower left) as a flower girl. Her sister in law remains one of my favorite Royal brides. Lady Alice Montagu Douglas-Scott had a crescent-shaped bouquet of English garden roses for her wedding to Prince Henry, Duke of Gloucester in 1935. Grace Kelly’s bridal bouquet featured lily-of-the-valley. After her religious ceremony, she left the bouquet on the altar of the Chapel of St. Dévote. Her “Juliet cap” headpiece was decorated with orange blossoms. Zara Phillips, daughter of Anne, Princess Royal, had a lovely bouquet made of white calla lilies, silver Senecio (dusty miller), lily of the valley, and hydrangeas. Giving a nod to the Scottish location of her nuptials she also included alpine thistles. When marrying Prince William, Kate Middleton used two sprigs of myrtle in her bridal bouquet. One was from Queen Victoria’s Myrtle and the other from Queen Elizabeth’s myrtle. The sprigs were nestled in the bouquet alongside lilies of the valley, ivy, hyacinths, and sweet William. What is your favorite Royal bouquet? What a great post, a fascinating read and awesome photographs! Another wonderful post, Laura. I have enjoyed this series so much! I think that Diana's bouquet is my favorite. I love a cascade, and hers really cascaded. what a fabulous post.. your blog is amazing! Your fave is mine too. That's a lovely bouquet. Shame it's not in color. Emjoyed reading all about the bouquets! And you're so right – you'd have to be building some arm strength up before the ceremony to carry some of these bouquets around for any length of time! I probably like Lady Alice the best, because it is roses and that is what I had for a bouquet. I love these posts so interesting! I am definitely partial to the English Garden Rose! I love this series! Such beautiful bouquets. I love Fergie's bouquet – I can't imagine having to carry some of those larger ones all day. Thanks for sharing. We're getting pretty excited over here, too. My oldest daughter and possibly my sister (the one you met) will sleep over at my house and get up early to watch the wedding. I hope you have a grand time in France, and don't forget to bring a container full of French goodies just for me!!!! I love how tradition plays such a role in the royal weddings; from multiple generations playing a role, to something so simple as laying a bouquet at the tomb of the unknown. All of the bouquets are gorgeous and I love the meanings behind the flowers. I do believe we are having a girls night to watch the wedding live on BBC. My hubby said he would stay in a hotel! ha! Some things you never outgrow! Amazing resarch Laura just amzing photographs of royalty!! my Fashionable Giveaway from The French Basketeer!! Wonderful post…as usual! Hasn't it been fun to anticipate next week by looking back? I have just finished my posts of Charles & Diana's wedding gifts. Happy Easter and have a lovely weekend. Very interesting. I admire the beautiful and lavish bouquets the royalty carried but my own was as far removed from theirs as could be! I carried a single red rose and baby's breath tied with a satin ribbon, my DH wore a smaller one on his lapel. Our matron of honour and best man had the same but in pink…my fav colour. I didn't throw it (which might have been wise since it could have poked somebody's eye out!) And if I were doing it again today, I would do the same all over again! I love a single rose. Thanks for sharing all the great photos and stories! Love the meanings of the flowers and the traditions. Yay for RWW!!! I can't believe the wedding is only 9 days away! How exciting. Our wedding book is bouquet themed and features famous bouquets from weddings past. One of them is Diana's bouquet. I had mine made based on hers, but with the Stargazer Lily as the main flower. I wanted a long trailing bouquet like hers. The fashion at the time was small bundles, but I was determined to have a long one. I adored it. Great post. Can't believe there's only one more on THIS wedding before the big day. Do you think there will be as much info available for the other royal weddings? I love the idea of the orange blossoms, though any citrus flower would do! 9 days til the wedding and that means 9 days til bon vayage! Oh, I have learned so much and all of your wonderfully researched informative and beautiful Royal posts will make the upcomoming royal wedding so much more enjoyable! I will be so sad when all of your Royal posts are over. I look forward to every one! Wonderful inspiration and information! Love it, very inspiring as I am in the midst of wedding planning with my daughter. I will have to look up the meaning of her chosen flowers. I am watching everything on tv labeled Royal Wedding!!! I think I will be in joy that day!!! !I plan on placing my newspaper clippings I inherited maybe Friday, as I watch 2 littles 3 full days a week, and NO time….so I hope I get it done!!! Lady Alice's bouquet was my favorite, too, although they are all gorgeous–hard to go wrong with flowers of any kind in my eyes! I left a comment here last night. Did you get it? This has all been not only informative..but fun!!! Thank you for doing all that you have done here for all of us! I love Sophie Rhys-Jones' calla lily bouquet. Such great texture and style! Another wonderful post, Laura! I really appreciate your fabulous research — this one took a lot of time! Nice photos. I think I like Princess Grace and Sophie’s best. Now I have to dig out my Princess Anne book and see what she had for her wedding to Mark Phillips. I think that dress was my favorite of all them. I didn’t know the history of the myrtle or some of the symbolism. Thanks! Such a beautiful as well as informative post. This is my first visit to your blog, I will return. So interesting. With all the shows going on right now , The Crown and Victoria, I’ve found it refreshing to watch documentaries to bring the stories back to reality instead of all the tv drama added. I enjoyed seeing all this info in one spot. Thanks for gathering all of it together to share with us. They are all stunning. This is so interesting. I really enjoy this series. I love all the information you provide for us . I find it most interesting especially since the series Queen Victoria has been on PBS. Also like the series of The Crown about Queen Elizabeth. Oh my, I love Catherine’s! I love the sentiment of the two myrtles, and I’ve always wanted to grow Sweet William. What a sweet bouquet. Another great post – thank you! I have to say that I love Katherine’s bouquet. I love the small white flowers and symbolism. I, by coincidence, will be in London during the royal wedding. I made reservations many months ago to visit the Chelsea Flower Show and tour various gardens in England. I decided to go about a week early and will arrive on May 18th. There were no reservations in Windsor when I checked, but perhaps I can take an early morning train there, but I think those reservations are filled too. Someone suggest something. I am up for an adventure! It is hard to choose a favourite. I love the idea of the myrtle being a part of each royal bouquet. Such a sweet tradition. A great post, Laura that I will enjoy studying! I adore flowers so I want to read this more than once for sure. So sad Queen Elizabeth had so many mishaps on her wedding day! Thanks for all your research. I love old pictures. You can learn so much from them. Watching The Crown and Victoria as following your royal posts have fascinated me. I can’t pick a royal favorite but off to look at my bridal bouquet picture! Lol! This was wonderful. I think I really liked Kate Middleton’s bouquet the best. I am a simple girl at heart. Also, I like that there was sweet William in it. My dear grandfather’s name was also William and he was a gardener. This was such an interesting post and it was also filled with so much bridal eye candy!! I really enjoyed it! Thanks so much for sharing and thanks for stopping by! !